Everyone I know (maybe I need to get out more) wants to be environmentally responsible, especially about climate change. After all, I live in Berkeley and work at a university. I know more about this than many people, so I wind up in conversations about how one could walk this talk, and I wish mightily for a 4×6 card like Harold’s financial summary, or Michael Pollan’s wonderful “Eat food. Mostly plants. Not too much.” But I keep using phrases like “you might think” and “actually, not always, it’s complicated”. For example, take today at work, where we have finally driven bottled water off the menu for events and have containers for compost, trash, containers, and paper waste. In the kitchen was a new stock of this product.Â “Wow, that’s one of the nicest PLA cups I’ve ever seen,” I thought; “biodegradable plastic is improving”. I looked at the bottom, and found it clearly marked PETE. Ooops. Polyethylene terephthalate (1 in the little triangle) is not biodegradable/compostable; it’s recyclable, just like almost any hard plastic, which means it can be melted down and made into something like a polyester schmata or another bottle or your new deck (in fact, this cup is 20% recycled PETE). This saves landfill space and reduces litter, but doesn’t matter for climate. I carried one around and asked people, “would you put this cup in the compost, or the trash, or the recycle bin?” Five out of five said “compost”, reasonably, because after all it has nice green leaves on it, and there are a fair amount of bioplastic cold cups in use, and biodegradable is good, right? Here is where it starts to get complicated. This cup, made from oil, has three possible futures. It can be burned as fuel, in which case its carbon goes into the atmosphere; or recycled into something, (with the use of more fossil fuel to haul it around and process it); or put into a landfill where it will stay more or less forever. Which do we like on climate grounds? If we burn it, it’s just a fossil fuel, an energy source that puts carbon into the air instead of underground.Recycling into product is good, but it just puts off the issue for another cycle or two. A little less than a third of US PET containers are recycled, so after two cycles 90% of the original material gets burned or landfilled anyway. And polyester fabrics go to landfills or the flame when they die, not recycling. What if it really were biodegradable? Then it could have another future, being metabolized by God’s natural little critters in a compost pile–into CO2 that goes into the atmosphere. Biodegradability is a feature for plastic that will otherwise be littered into the landscape or the ocean, but a bug for materials captured in the solid waste system that can be landfilled. Unless you care more about landfill capacity than climate; at this point, I do not. So for the most of it that isn’t practically recyclable into new products, burning and at least getting some energy out of it is better than composting, and unless you’re going to burn coal to make up for what you give up as fuel, landfilling is best from a climate perspective. In California, where our electric grid is pretty low-carbon, the landfill is the best future for that cup (and putting it into the compost stream just messes up the system). 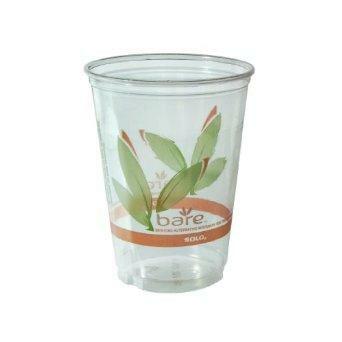 Bioplastics are generally biodegradable; this is what Solo wants us to think about this cup. And it’s better to make plastic out of plants than fossil fuels, because the carbon comes out of the air where we want less of it, right? This last can be true, but it depends a lot on what plants, grown how, where, are used as feedstock. Wood from a sustainable forest operation can become fairly green rayon or cellophane. Wood from tropical deforestation, not so much. And the hot bioplastic these days is PLA, which comes from row crops and sugarcane. By the time we account for the N2O (a potent greenhouse gas) released from fertilizing these, and the diesel to drive the tractor, and the forest burned to make room for the crops, bioplastics are often not much less fossil-carbon intensive than plastic from oil and natural gas. But at least they’re biodegradable, right? Again, this is either a feature or a bug just as it was for the petroleum plastic, and without reference to the original source of the carbon. In fact, the planet would be well served by non-biodegradable biomaterials (pace the question about their real life-cycle carbon intensity)that would take carbon from the air, do something useful with it along the way, and then hold that carbon underground. There’s no excuse for Solo’s tacit greenwashing of this product, but it’s not at all clear that the thing they want us to think it is is actually more sustainable than what it really is. What's the replacement for bottled water? Regular tap water in a re-usable water bottle? Purified water stored in other forms? A pitcher of iced tap water is pretty good. There are places where tap water really doesn't taste good, but in US coastal cities, it's almost always excellent (so good that Dasani bottles it up to sell, actually). And public water sources are very closely monitored by government for safety; bottled water is pretty much unregulated. If you want to carry it around, fill your portable bottle from the tap. If you are sure this or that bottled water tastes better than your tap water, do a double-blind taste test with some friends and you'll probably find you can't tell the difference. Agreed, but then again, I use a Britta (sometimes with generic filters) to filter my tap (I can smell the chlorine though I'm still glad there is some). And I have noooooo idea what the math is on the Britta. It's possible I could just stick in a chunk of charcoal in a glass pitcher, and forget the plastic parts, if I knew what kind and where to get it. Oh cr*p! Charcoal … there's got to be some math on that too. Otoh … I reuse a Snapple bottle. It goes in the dishwasher every so often too. It's easy to wash the lid (which I could probably put in the DW but don't). Maybe we should just go back to mugs? Harumph! You could get a headache wondering about relative advantages and disadvantages, but in this blindingly complicated assessment, it seems there is one truism–trying to figure out what to do about plastic, and which plastic is better, is still about plastic. What happened to the good old simple paper cups of our youth? Mike – you need to get out more! I saw one of these on the Front Range recently, a day or two before that article came out. "Affront to many things" was my first thought. De minimis. I'll post soon starting from the big numbers, I promise. I like Mike’s counterintuitive idea of nondegradable bioplastic junk as sequestration. They should make it denser so it doesn't float: there are enormous Sargassos of plastic trapped in vortexes in all the big oceans. Not so much re the Sargassos of plastic. Recent quantitative surveys show that this particular and extreme view of the marine plastics problem is a myth. The large majority of plastics in the pelagic marine environment are very small particles and initial, preliminary mass balance estimates show there is much less than would be expected. Negatively buoyant plastics would simply drop to the bottom where all sorts of potential benthic impacts need to be considered. Should I be reassured by the fact that the plastic particles are tiny and more likely to be eaten by fish? Since they float, they won't fall to the ocean floor in the normal way, just circulate round the food chain for ever. I agree we should not treat the ocean floor as a free dump, but it we have to choose between tuna and hagfish, it's not too difficult. The endless rain of fish feces (but not whale, see here) presumably covers rubbish fairly quickly and over the aeons turns it into sedimentary rock. I suppose it’s a natural sequestration mechanism (from the fish bones). The impact is real. Fish eat the particles which kills them or mutates their offspring. We eat the fish and we sicken as well. I think it is safe to safe a lot of the bottom-dwelling sea plants and animals are also becoming sinks for poisons since they'll consume both the plastic and the carcasses of the poisoned fish. At a time when wild fisheries are already under serious stress, it is just one more thing to make it worse. "When these small plastic particles float in the ocean, they attract and even absorb heavy metal contamination and other pollutants. This could explain why those with the dirty plastic food saw the greatest concentration of pollutants. Further, they saw the most internal damage." This meditation is more argument for a carbon tax. Like a VAT, which avoids complicated rules about deductibility of business expenses by taxing the easier-to-measure value added, a carbon tax (mostly) sidesteps problems with measuring things like the carbon intensity of bioplastics. The fertilizer and diesel inputs and (untaxed?) competitive benefit of crop residue for energy generation would sum to an appropriate cost level for comparison to petroleum-based plastics. My guess would be that retail-use plastics of all kinds — water bottles, cups, grocery bags, etc. — are a completely insignificant contributor to global CO2 production and a minor constituent of the overall solid-waste stream, and not worth the mental energy they attract. My Berkeley-born daughter feels differently, so we are required to collect our plastic produce bags from Monterey Market to take to the recycling bin. Part of what your post doesn't cover is the value of sustainability. Understandable, as sustainability as a topic seems to have fallen out of use these days. Growing plants with a minimum of pesticide/inorganic fertilizer to turn into plastics/substitutes is far more sustainable than relying on fossil fuels. Sustainability should be seen as a proper counterbalance to carbon and disposal concerns, it levels out the curve to more predictability, and has appreciable domestic economy / national security benefits. F.e. — how can climate change be divorced from sustainability? Such as to be a counterbalance? Seems to me, CC is *the* issue, and everything else has to be looked at in terms of it. It sounds as if recycling is still better than immediate landfilling — you can always put one of the cup’s descendants in a landfill to sequester the carbon, but in the meantime you’ve reduced primary consumption. Even two trips around get you down to a third of baseline rates, modulo the (fairly minimal) additional processing costs. Unless you’re arguing that recycling frees up primary-consumption capacity for things that can’t be sequestered, but in that case you’re getting into Che territory.